Enjoy hours of endless fun creating pages that capture your most treasured memories and keepsakes. Memory Book Page Protectors provide acid-free, archival quality protection for long-lasting memory preservation! Fits any 3-ring binders and most 2-post album. Pages featuring our Universal Hole Punch with Extended Binding Edge work in strap albums. 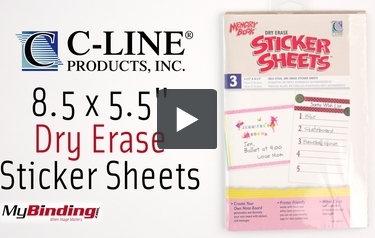 C-Line allows you to be creative and design your own memory scrapbook with these fabulous dry erase sticker sheets! Insert Size: 8 1/2 x 5 1/2"
Transcript: Welcome to MyBinding Video. These are the 8.5x5.5” Dry Erase Sticker Sheets from C-Line. These self adhesive sheets can be applied anywhere you need a dry erase surface. You can even print on bullets, lines or borders if you want. After printing, remove the adhesive backing and press firmly to adhere. Then you can write and erase over and over. There are 3 dry erase stickers in each pack. For more videos and all your binding needs, visit MyBinding.com. Welcome to MyBinding Video. These are the 8.5x5.5” Dry Erase Sticker Sheets from C-Line. These self adhesive sheets can be applied anywhere you need a dry erase surface. You can even print on bullets, lines or borders if you want. After printing, remove the adhesive backing and press firmly to adhere. Then you can write and erase over and over. There are 3 dry erase stickers in each pack. For more videos and all your binding needs, visit MyBinding.com.